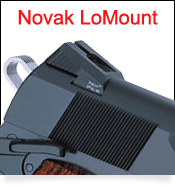 Adjustable Novak Low mount recesed blade rear sight for Remington R1 Enhanced. 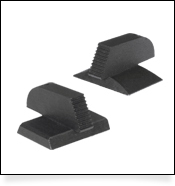 I ordered this part along with its front sight match on a Thursday at noon online, and it was in my mailbox Monday! The original Remington rear sight was harder than I anticipated getting out, have a decent brass punch and a vice handy. 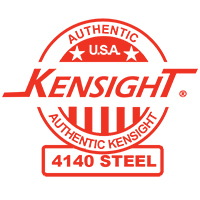 The new Kensight rear sight was about .008" wider across the base than the original and after contacting Kensight was assured they were made to be a little oversize and had to be filed to fit. I used a 90* grinder with a used 24 grit Roloc disc to carefully take a little off each face until my dial calipers indicated I was within about .001". I am no Machinist (nor do I play one on the internet) but after coating each face with black marker, I c-clamped a big flat file to a board clamped in the vise and filed each face until the black was gone. My new Kensight sight fit good with just a little persuasion of the brass punch. I used a little blue JB weld thread lock on the sight and set screws as I assembled it with a laser bore sight aligner installed to center it. I left the original fiber optic sight on the gun (by eyeball it looked close to the same height as the new one) but I am shooting several inches high at 50 yards even with the rear sight all the way down. I will have to install the new front sight also, but I was only off two clicks left of center. It appears to be a very quality made part; I'm sure much better than I can shoot!